Lucy Jo Ellis has moved to NYC and is working in an entry level position for a fashion designer with a dream of becoming one herself. She’s awkward and unpolished and on the night that everything turns wrong, she meets Wyatt Hayes IV. He’s just dumped his socialite girlfriend and bet his friend he can turn any woman into a New York socialite, deciding he can jump start his sagging anthropology career by documenting the experiment in a book. Lucy Jo, desperate for a job, accepts the challenge and the fashion contacts he promises. Their lives converge as they engage in a roller coaster ride beginning with a personal trainer and ending with lavish parties and benefits while Lucy’s life becomes blurred as she tries to figure out who she really is and who she wants to be. 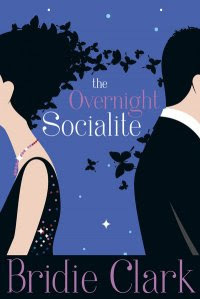 The Overnight Socialite was a fun chick lit read that I quite enjoyed. It was an easy, fast paced book that made me laugh and I had a smile on my face through to the end. Although the ending was predictable, The Overnight Socialite was a smart, fun read that I enjoyed curling up with. I was fascinated seeing how the other half lives, loved the New York details and the lavish lifestyles and seeing Lucy Jo’s transformation from a small town girl to socialite. I thought that even though the story was a version of the classic Pygmalion tale, the environment and twists were enough to make it different and interesting and I was kept intrigued throughout. I really enjoyed The Overnight Socialite. The only thing I knew about it before reading it was that it was it’s a modern day Pygmalion- so I had the Henry Higgins/Eliza Doolittle story firmly in my mind before I began and I wasn’t disappointed (even though I assumed I knew how it would end). Bridie Clark writes a complete story- by that I mean that the people are fully developed- they have character as well as background and they have complete relationships with family and friends. Given that there are quite a lot of people in The Overnight Socialite I was very impressed that no one got lost! Amazing also is that the characters overlap within the novel and develop new relationships too. The plot is fast paced, full of fashion details and social events- you feel like you’re in a whirlwind of activity from start to finish. I especially loved the quotes and notes at the start of every chapter- they were perfectly chosen and sometimes helpful, sometimes just funny. And to be honest Lucy Ellis and Wyatt Hayes weren’t exactly Henry and Eliza which was great!